Happy Holidays Elmo - 12"
Let Elmo join the family on all the fun this Christmas! Your children will be so surprised to see him sitting under the tree Christmas morning. Perfect for your children, grandchildren, nieces or nephews to cherish forever. 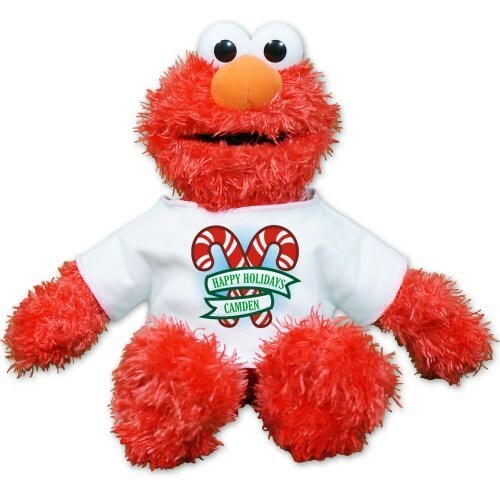 Elmo wears a t-shirt that features our Christmas Candy Cane Design. The holiday design is so unique because it may be personalized with any name to make it a loving keepsake! Elmo is filled with beans at the bottom so he makes the perfect sitting pal on your desk or shelf. Along with the super soft, silky fur, Elmo measures approx. 12” of perfect, cuddly goodness. Surface Washable. Free personalization along with free gift wrapping and a free gift card to create a thoughtful presentation.